Scott Walker has always been against rail systems, whether it be Mayor Tom Barrett's light rail idea or President Barack Obama's high speed rail. To be honest, he's not against rail systems per se, since he loved Wisconsin and Southern, especially since it's CEO, William E. Gardner gave him illegal campaign donations and tried to take the fall for Walker early in the Walkergate investigation. But Walker does generally oppose any rail because it doesn't increase the wealth for the road builders or the CEOs of the gas and oil companies. And Walker needs those people happy and paying as Walker tries to run two campaigns at the same time. During the 2010 gubernatorial campaign, Walker made his opposition to Obama's high speed rail a central part of his campaign. Shortly after when the election, Walker apparently got his way and the high speed rail was killed, along with the $800 million and thousands of jobs that came with it. But Walker wasn't done. He stopped payment on the order for two new train sets from Talgo, a train building company based in Spain who came to Milwaukee with the help of then Governor Jim Doyle. He also cancelled the maintenance shed which would be required to keep the trains running. He cancelled these things even though tens of millions of taxpayer dollars had already been invested into them. As a result of Walker's rash and foolish actions, the taxpayers and the workers of Wisconsin have been hurt time and time again. Talgo has prepared to pack up and move to a more train-friendly state with a much more intelligent governor, like Illinois. Their leaving would cost Milwaukee 35 established jobs, not to mention another couple hundred that they wanted to expand by. And Talgo wasn't about to leave empty-handed. They have filed a lawsuit against the state for the rest of their money, based on Walker's breach of contract. It also turns out that the repairs to existing train maintenance facilities and lines that would have been covered by the federal high speed rail funds had to be paid out using our tax dollars. While we have seen the state lose money hand over fist and bleeding jobs because of Walker's infinite lack of wisdom, other states that didn't have myopic governors have been benefiting from the high speed rail program. To have 10 daily round-trips, the two states may need a third train to join the two Amtrak is currently running. The only way to avoid it would be to run the new routes before the earliest current morning departures and after the latest evening departures, said Amtrak spokesman Marc Magliari. The earliest Milwaukee departure is 6:15 a.m., and the latest is 7:35 p.m., he said. If a new train is needed, the states could either ask Amtrak if it has any extras in its fleet, or procure their own, Magliari said. “They could come to us and say do you have the equipment to support another set, and we’ll see if we do,” he said. There’s a chance Amtrak may have some spare trains in the coming years, Magliari said. Four states, including Illinois, are buying new train sets to replace some of Amtrak’s. Manufacturer Nippon Sharyo is building those 130 rail cars in Rochelle, Ill., for Illinois, Missouri, Michigan and California. Meanwhile, two trains that Wisconsin paid for, at least partially, for the Hiawatha are in storage in Milwaukee. Talgo officials claimed the company is owed $10 million on the original $47 million contract with the state of Wisconsin. Talgo still owns the train sets, and sued the state after elected officials refused to pay for a maintenance facility to service those trains. They cannot run without such a facility. All told, Walker's folly has cost the state around $1.5 billion and tens of thousands of jobs. And that's just from one policy decision. Imagine how much his other knuckle-headed decisions have cost us. 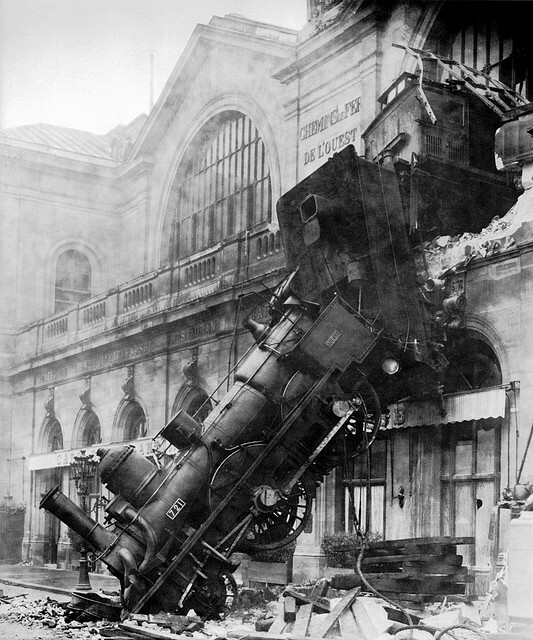 Walker's handling of the whole high speed rail is a good metaphor for his entire time as governor - just one endlessly recurring train wreck. This is a good example of how Walker is anti-business, unless the business owners pony up the big bucks into Walker's campaign coffers like Gogebic Taconite did. Even with optimistic job creation estimates, Gogebic Taconite will not create as many jobs as Walker lost when he canceled high speed rail. In addition, the job creation from high speed rail would be happening now, whereas Gogebic Tactonite won't create jobs for many years, except for security thugs from Arizona. Was Martin Luther King Jr. A Republican? Scott Walker: Did I Say That? It's Gettin' Hot In Here! Can You Spot What's Missing? Cronyism In The Capitol - So What Else Is Old? Prescott, AZ - A Republican Case Study! The Unfortunate Reality of Act 10.